Chloe will be 3 years old August 13th. She weighs 11 pounds. 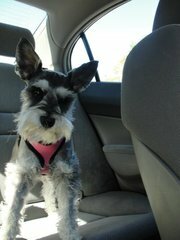 She is a black and silver miniature schnauzer. 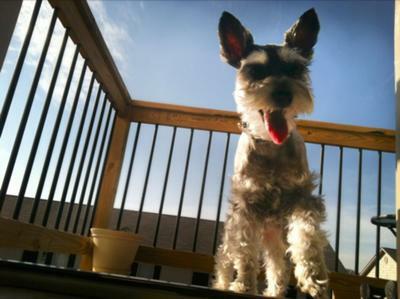 She is the sweetest schnauzer ever. She loves to be right beside me wherever I am. I don’t know what I would do without her in my life. Chloe is so sweet, when I am sitting on the couch she likes to get as close as she can to me. She loves to stand on our balcony and just watch everything that is going on. She also loves to ride in the car, she loves hanging her head out of the window although her beard blows in her face. She is such a little girl she doesn’t like to get her paws wet when the grass is wet in the morning. She always holds her right paw up when the grass is wet. It is the cutest thing in the entire world. Chloe will be getting a baby brother schnauzer in August. I cannot wait to see her play with him.